I hope you like the new style newsletter. We’re still bringing you the best content and are always happy to hear from anyone in the recruitment space who wants us to consider including theirs. If you enjoy an article we’ve used please do use the new “social share” buttons to let your network know. Are you in an interview rut? Do you always ask the same questions? Ok, so they probably get the job done but changing your routine a bit might help you to get to know your candidates even better. Let's face it, we're all on a budget and anything that can help you find candidates AND save the budget has immeasurable value. So, the lovely people at MightyRecruiter asked seven top recruiters which free tools they turn to when they are looking for the perfect candidate. From using the bathroom, to who can be fired when, to jobs for the boys and jobs for the girls ... it's a funny old world out there. Eploy is cloud recruitment software for ambitious agencies. 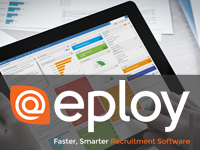 Combining Recruitment CRM, Sales Pipeline Management and Dashboards & Analytics - Eploy is the complete solution for modern recruiters. Textkernel is the international leader in AI, Machine Learning and Semantic Technology for matching people and jobs. Improve the candidate experience, increase your ROI on sourcing and fill more jobs faster. "Recruitment is a skill like any other, and like all skills it requires training, experience and discernment. It also involves developing a network of contacts and building relationships with talent. Then there are the resources involved in delivering effective recruitment. There comes a point in your company’s development when you have to decide whether you want to handle the recruitment process in-house or do you want to outsource it to a recruitment agency." Here are a few tips for recruiters to easily spot the person right for the job. And, no, this isn't another article on how to make the most of social media profiles! Getting Your Content Right: What is Great Content and What Wastes Valuable Time? hosted by the award-winning Glenn Southam, Head of Marketing Operations for StaffGroup. With 14 years inside similar roles, there are few that understand the role of marketing for recruitment agencies, like Glenn does. Tech Can Make You More Human! Katrina Collier, Social Recruiting Trainer & Keynote, and Audra Knight, Employer Branding Nerd, chat to Jackye Clayton, Digital Content Editor of RecruitingDaily.com, about using technology to be more human. It'll definitely be a debate! Recruiter Experience for the Benefit of Candidate Experience & Brand. Talent Attraction Strategist & Social Recruiting fire-starter Steve Ward (@cloudninerec) will be chatting with Matthew Cooper, Senior Tech Recruiter at Booking.com.